If you’ve been faced with the task of selecting hardwood flooring for your home, you’re very aware of the myriad of choices out there, and possibly painfully aware! Too many choices can be overwhelming, and it’s not just about selecting a color you like. Other criteria to consider are the species of wood, the width of the planks, and whether you go with a solid or engineered hardwood. What’s the difference anyway? Is engineered still real wood? And why does it matter which one you choose? There’s SO much information to share on this topic, as well as other selection criteria, but this time I’ll touch on the main factors to consider. Let’s start with a quick bit of terminology that you’ll find throughout this post: Species is the term used for the type of wood (i.e. oak, mahogany, etc. ), and Plank is the term used for the individual pieces of flooring. Planks come in varying widths, anywhere from 2 1/4″ up to 7″ being the most common sizes. Engineered ~ Yes, engineered flooring is also real wood, but instead of being solid throughout, it’s a thin layer of the species (usually 1/16″ or less), then applied to other laminated hardwoods underneath (basically plywood). 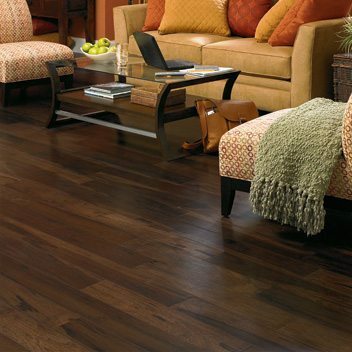 It’s usually 3/8″ – 5/8″ thick overall, and is still considered “hardwood” because it is actually all wood. Engineered hardwood is normally used in applications where it’s being installed on a concrete slab construction, or where there are concerns about abnormal exposure to moisture. Because of its multiple layers and adhesives used, engineered hardwood is a more stable material, and isn’t as susceptible to shrinking and swelling, though it’s not completely impervious. Pre-finished vs. Unfinished ~ Unfinished flooring (referred to in the trade as Sand & Finish) is raw material, and has no sealers or top coat of any kind applied prior to installation. This is what you’ll find in many older homes dating from the 1960’s and prior. The installation process for unfinished is more time consuming since, once installed, multiple layers of Polyurethane need to be applied, and dry-time in between must be allowed, as well as sanding. That equals time and dust. Pre-finished flooring arrives from the factory ready to install and walk away. The durability of a factory finish is superior to hand-applied finishes, and many carry a 25-year warranty. The ease of installation with regard to the time and mess involved is significantly less than with unfinished. I hope this has helped to take a bit of the mystery out of hardwood flooring. Your local flooring showroom can certainly answer many of the other technical questions about flooring, but there are also design elements to consider such as color, plank size and smooth vs. distressed. The right selection can greatly accentuate the style of a home, while the wrong one will simply look out of character. If you’d rather be armed with the knowledge you need before visiting the showroom, a consultation will narrow the field so you have a better idea of where to spend your research time, and actually enjoy the process. Design should be fun, not stressful! Thank you so much for this information! It helps to take the mystery and intimidation out of the selection process. My impression is that the darker finishes and wider planks are the most popular right now – is this true? What species is the most eco-friendly? Is it bamboo? Wider planks and darker finishes are definitely popular right now, and I’m especially recommending the wider planks for larger spaces. Bamboo is very eco-friendly, as you said, and some of the other species are becoming more scarce, therefore expensive. Cherry is mainly grabbed up by the furniture companies, as is mahogany, so this keeps the pricing higher on those than other species. Great post! It was enough information that I learned something and It wasn’t overwhelming. 🙂 Flooring is an expensive investment in a home that can really improve the overall feeling of the home, you really want to make sure you get it right the first time. It’s not as easy of a change as drapes, it’s a foundation design piece to any home. Thanks Kathy! Flooring is definitely the foundation of a home, and I refer to it as the backdrop for every room, so it’s important to make a selection that compliments the style and color scheme of the home. Thanks for your comment, Randi! Solid wood flooring is the best house coverage to receive a high degree of insulation of the flooring, because timber is the very best all-natural insulation product that can be utilized for inside and outside partitions. Thanks so much, Karen, and I’d be very appreciative if you’d direct your clients to my blog! I’m happy to answer any question they have. I don’t have plans for a follow-up to this post at the moment, Gardening Strands, but it’s good to know that you liked it! I’ll keep this in mind for future posts, and people do have lots of questions about flooring. Thanks! Thanks for posting so nice and mind blowing post. I’m glad you liked the post! Thank you, Pankaj.